Animals that can adaptively camouflage are always rather fascinating, but how about an octopus that sees in black and white and can vary its color and texture. There is a fabulous video clip. Animals that can adaptively camouflage are always rather fascinating, but how about an octopus that sees in black and white and can vary its color and texture? There is a fabulous video clip from Roger Hanlon, senior scientist at Woods Hole Marine Biological Laboratory that found me through various friends (thanks to Facebook). Roger Hanlon said that “when I captured the first scene I started screaming”,,,click here to find the video. 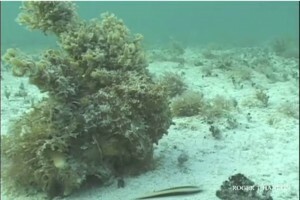 Here are 2 stills from that video, as the cameraman approaches the octopus decides to “de-cloak” and swim away. 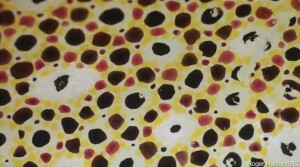 This is repeated as the octopus finds other spots to “re-cloak.” Later in video, they show close ups of the octopus skin that has CMYK spots that can vary in size and presumably sensors that can map the surface that the octopus is contacting. It is not clear how they pull of the texturing trick. 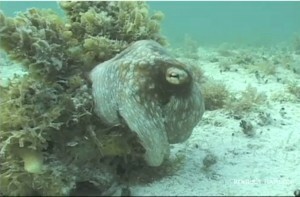 The remarkable point is that the octopus has developed a color cloaking solution that could implemented by humans. Top Gear, of all people, have put an RGB display on the side of a van ! I wrote about a cloaking demonstration in 2011. All in all, just a wonderful demonstration of the power of evolution.